Nancy Pelosi spoke to reporters as US House candidate Lori Trahan (right) looked on in Lawrence. LAWRENCE — She is staring down perhaps the most serious challenge to her leadership post to date. To Republicans, she’s a political cudgel to wield. Among Massachusetts’ two first-time Democratic congressional nominees, she’ll find no public commitments of support. So arrived Nancy Pelosi, the US House minority leader, who whipped through Massachusetts on Tuesday to tout the Democratic party’s chances on Nov. 6, her own prospects of staying in House leadership, and, locally, the Democrats’ pick for the state’s only open congressional seat. The stops were part of Pelosi’s barnstorming tour for a slew of House races across the country. It comes as Democrats are pushing to take control of the House majority, with Pelosi pointing to 83 “Red-to-Blue” races she’s tracking — more than half of which include female candidates running in the first midterm elections since President Trump’s 2016 victory. In many of Massachusetts’ reliably blue locales, the California Democrat largely found praise awaiting her. After headlining a fund-raiser in Concord for Lori Trahan, the Third District’s Democratic nominee, Pelosi appeared at a forum at Lawrence General Hospital, where she was lauded for pushing the Affordable Care Act into law as then-speaker. There, she ticked through her priorities if Democrats were to win a majority in the House — health care, campaign finance, and infrastructure among them. Later, she addressed an audience at the Harvard Kennedy School’s Institute of Politics, where she boasted of the party’s diverse crop of candidates, describing them as “little drops of water” in a potential Democratic wave. That, while showing little concern for Republicans’ repeated efforts to fashion her as a political albatross for Democrats in competitive districts. Trahan, too, hasn’t committed, even as Pelosi dropped into the Third District for the early morning event on her behalf. 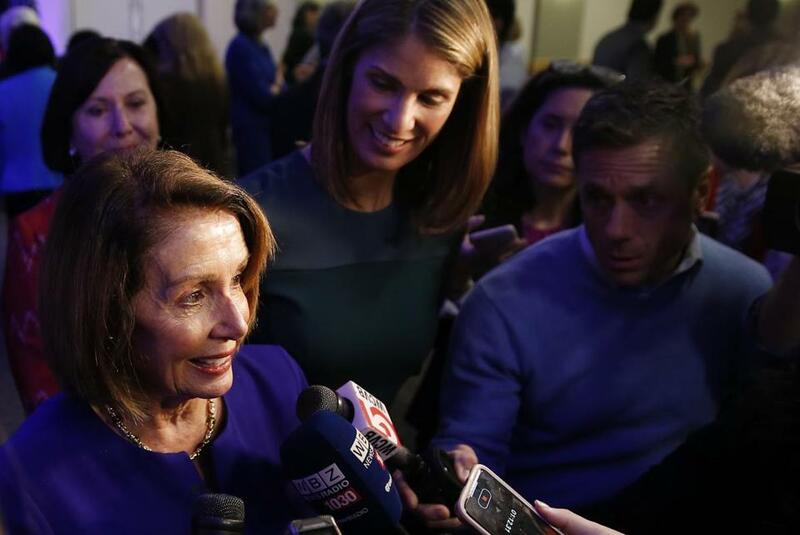 Pelosi told reporters in Lawrence that Trahan would be “a wonderful, effective member from the start,” and emphasized her efforts to back fellow female candidates across the country. Trahan — who faces Rick Green, a Republican and Pepperell businessman, in the general election — emphasized she won’t make a decision on her leadership pick until after the Nov. 6 vote. Pelosi’s image in the 37-community district is mixed: Less than 50 percent of likely Democratic primary voters have a favorable view of her, according to an August Boston Globe/UMass Lowell poll; 25 percent hold an unfavorable view. Trahan, however, called Republicans’ efforts to paint Pelosi as a negative for Democrats as “completely unfair.” Trahan, Green, and independent candidate Mike Mullen are vying to replace retiring US Representative Niki Tsongas. 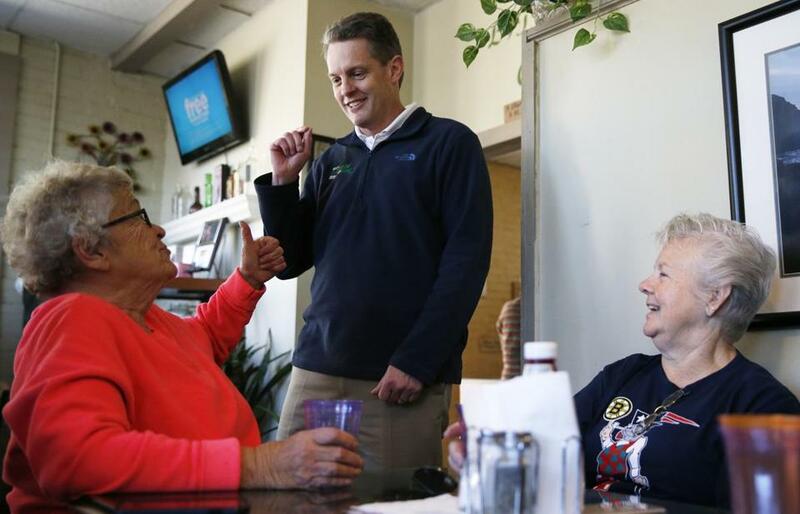 Republican House candidate Rick Green chatted with Marjorie Payne and Maureen Donnelly at Littleton Cafe. He also criticized her effort to raise money for Trahan simply as a way to solidify backing in the Democratic caucus. “That’s just part of the DC circus of buying votes for leadership,” Green said. The House wasn’t the only topic Tuesday. Pelosi sidestepped questions on US Senator Elizabeth Warren and the fervor around a DNA test she released Monday showing evidence of Native American heritage in her family dating back anywhere from six to 10 generations ago. The move by the potential presidential candidate was intended to calm the debate about her background dating back to her first Senate run in 2012. But it also did little to silence her critics, including Trump, who once challenged Warren to take a DNA test should the two ever meet in a presidential debate. “I think it’s probably looming larger [here] than other places,” she said.